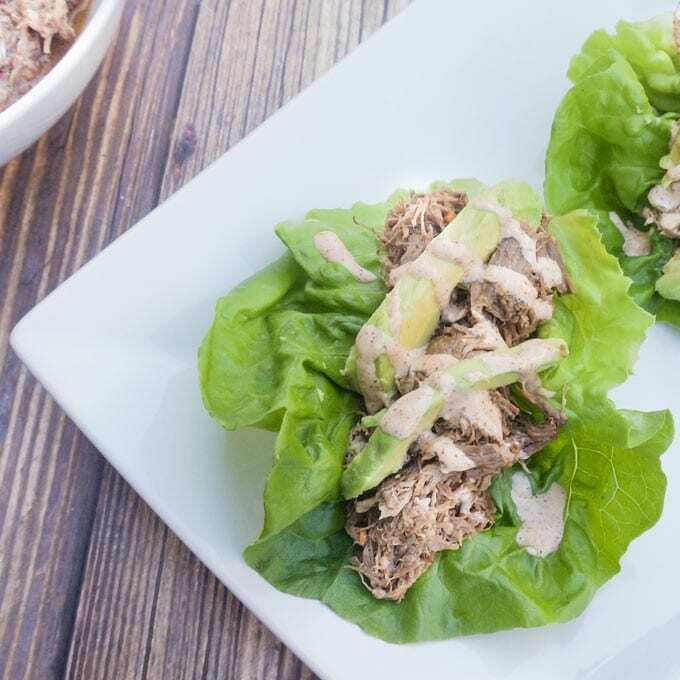 This Chipotle Barbacoa Copycat recipe is one of the first that I experimented with in my Instant Pot. It has been a staple in our home ever since! This magical cooking vessel does all of the work of 8 different kitchen gadgets in a fraction of the time. It easily takes the place of an electric pressure cooker, a sauté pan, rice cooker, steamer, yogurt maker and warmer. As I experimented with various cuts of beef and seasonings, I was instantly addicted. The end result is meat that is fall-apart-tender in as little as 30 minutes. Traditionally, barbacoa is a shredded beef that may include some interesting parts like the tongue and head. I opted for a beef chuck roast instead. The beef is slow cooked with many different aromatics including chipotle peppers, apple cider vinegar, ground cloves, bay leaves, and cinnamon. I’ve also included instructions for a slow cooker and dutch oven in the recipe card. To be completely honest, I love Chipotle’s barbacoa. It’s delicious. It has a great texture… and the flavor is always on point! Unfortunately, it’s a little pricey. With double barbacoa, sour cream, cheese, salsa, pico de gallo and guacamole, my bill inevitably comes out to almost $15. The lack of rice and bean definitely contribute to this, but those aren’t very Keto-friendly. You can also add romaine lettuce (free) in place of rice and beans, so keep that in mind. I don’t mean to brag, but I feel like my recipe might be better. One thing is for sure, I think this is as close to a Chipotle barbacoa copycat as you can get. In addition to this recipe, I also have a full guide dedicated to eating out at Chipotle! Check it out for some easy on-the-go options. My Instant Pot Barbacoa is packed with flavor and the leftovers are absolutely fantastic! Turn on your Instant Pot to 'saute' and wait for it to come up to temperature (make sure the lid isn't on). Prepare the roast chuck by removing any large pieces of fat (optional, I don't like eating fat that is chewy) and then pat dry with paper towel or kitchen towel. Season all sides of the meat with 1/2 tbsp salt and 1/2 tbsp pepper. When the Instant Pot has come to temperature, add the bacon fat directly to the pot. Once melted, add the beef. In a blender (or with an immersion blender), blend together: lime juice, apple cider vinegar, chipotle peppers, adobo, cumin, black pepper, salt, tomato paste, oregano, cinnamon, onion powder and ground cloves. Puree until smooth. Once beef is browned all over, cover with puree. Add bay leaves and broth. Close the lid and set on on Manual > 50 minutes. Make sure that high pressure is selected. After the time is finished, turn off the Instant Pot. I highly recommend doing a natural pressure release (NPR) by letting it come down in pressure itself. This usually takes around 20 minutes, but it always comes out so juicy and tender! Shred, return meat back to liquid and serve. If you do not have access to an Instant Pot, you can still make this recipe in a slow cooker or Dutch oven. Should you choose to go this route, just sear your meat on all sides, cover with blended sauce and cook on high for 6 hours or low for 8-12 hours. This Chipotle Barbacoa Copycat Recipe is great for get-togethers! I like to make mock burrito bowls using Cilantro Lime Cauliflower Rice or wrap it up in a low carb tortilla. For those with friends and family not following Keto, you could just as easily serve with flour tortillas. Finally, this recipe serves as a great protein source for meal prep as well. I like to make a big batch, shred the meat, and portion into separate containers. 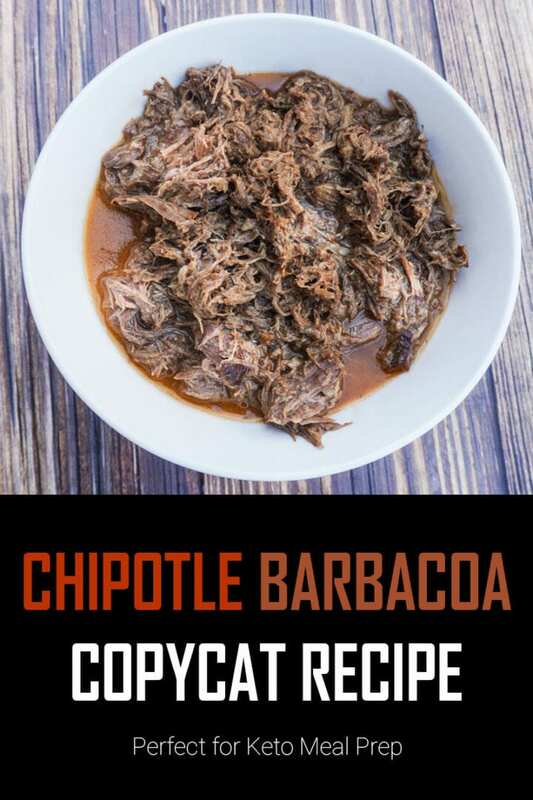 Have you tried my Copycat Chipotle Barbacoa recipe? Let me know what you thought in the comments! Would this still work with beef cheek? I haven’t tried it, but it should! How would you make this in a normal crock pot? I would just mix all ingredients (aside from the meat) together and put into the crock pot. Sear the meat in a pan and transfer to crock pot. Cook on low until pull apart tender, probably 5-8 hours! I’ve made this recipe no less than 5 times in the past few months! It is amazing! I’m wondering if the 1 tbsp black pepper is a typo. I used less than that when I made it last night and it was way too peppery. It was delicious otherwise! It was even better than Chipotle’s.